Japanese cinema is one of the richest and most eclectic — so of course this list of 10 films is far from exhaustive (no Mizoguchi, no Naruse and no Oshima are basically crimes against cinephilia for which I am very sorry, but they’ll find their way into future lists). The hope is that this list can serve as an introduction for those wanting to dip their toes in and have a platform from which to explore further for themselves. To give as good a recommendation of the wide mix of Japanese films as possible, I have stuck to a rule of one film per director and gone for a range of different genres. In this silent masterpiece, two mischievous young boys, whose expressive faces alone are enough to make up for the lack of sync-sound, believe their father to be a hero respected by all. That bubble bursts when, barely believing their eyes, they catch sight of him grovelling to his boss. Family life won’t be the same in their household from that day on, and they learn a valuable lesson about father figures and adult life. 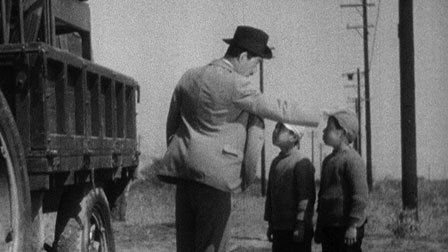 Director Ozu was one of the masters of the so-called golden age of Japanese cinema, and the way bittersweet realities of life are relayed with visual prowess (linking the compromises of children at school with those of adults at the office through a matching cut) and irresistible humour (the goofy rituals of the children in particular) are the mark of his expert touch. He would later remake this as a talkie in 1959 but the charm of this 85+ year-old movie still stands up on its own. Some may know the legendary Akira Kurosawa better for his samurai period films, but this contemporary-set tale of life-affirming humanism is right at the top of his achievements. Takashi Shimura would play a muscular warrior in Seven Samurai one year after Ikiru, but here the unforgettable sadness of his eyes and dejected face show his incredible versatility as an actor. He plays a meek middle-aged widower, disliked by his son and stuck in a civil servant job where bureaucracy doesn’t let anything get done, and who cruelly realises the emptiness of his life when he learns he is dying of terminal cancer. But at this point comes Kurosawa’s poetic touch, and a perceptive honesty worthy of the great Russian literary figures he revered so much, for the man still gets a chance to give meaning to his life. Ikiru is a beautiful and affecting ode to the importance of modest acts of goodness and to the preciousness of life. A destitute and masterless samurai (played with stoic presence by the great Tatsuya Nakadai) enters the manor of a clan leader with a simple request: to use the forecourt so he can perform the traditional suicide ritual of seppuku (also known by the more informal term harakiri) in the correct manner. The clansmen doubt his sincerity, and suspect him of seeking to land a new job out of pity. But the intricate story, revealed over flashbacks in this gripping and suspenseful drama, will show how much they underestimate him. Filmed in stately wide-angle Scope, this is a classic of the samurai genre unlike any other, in many ways an ‘anti-samurai’ film critiquing the hypocrisy and inhumanity of dogma, making a thinly veiled statement about Japanese militarism which the pacifist director Kobayashi felt had not faced enough accountability. An amateur beetle-collector from Tokyo, on a field trip in a remote part of rural Japan, misses the last bus home and is left stranded, having to seek overnight shelter at a nearby village. Offered a place in the home of a young widow, whose house at the bottom of a sand pit is only accessible via a rope ladder, he wakes up the next day finding the ladder gone and himself trapped in the house against his will. The fruit of a collaboration between two artists who were already established in different fields (director Teshigahara as an artist, and screenwriter Kobo Abe as a novelist and philosopher about whom I wrote an extensive essay), and came to cinema with a very original approach, this existentialist, modernist oddity is a unique film, both sensory and cerebral, leaving the viewer shaking off imaginary sand and pondering the meaning of life at the same time. The Yakuza film is Japan’s version of the gangster film, and Tokyo Drifter is rebel director Seijun Suzuki’s inimitable version of the Yakuza film. Former hitman Tetsu, dressed in his trademark impeccably cool suits, is attempting to leave his life of crime behind and go straight. However, there’s a gang war going on and his boss has very different plans for him. The premise might sound conventional, but Suzuki’s treatment of it is anything but, as he throws realism and the rule book out of the window to create a film inextricably his. The result is a jazzy, trippy, colourful, incredibly stylised and entertaining gangster flick, at times playfully surreal, at others garishly pop-art, but constantly surprising and visually exhilarating. Long before dispassionate portraits of serial killers became fashionable, maverick director Shohei Imamura (who had once been Ozu’s assistant director) made one of the most unsettling examples of this genre. Based on real events which shocked Japan, the film chronicles the 78-day killing spree of cold-blooded sociopath Enokizu (portrayed by an incredible Ken Ogata performance) with an almost documentary-style realism and a careful eye for the smallest details. Enokizu’s actions are never explicitly explained nor judged by the film (it ends with a memorable, surreal final scene which can have many possible meanings), but as he goes on the run around Japan, plenty of scope is left for Imamura’s wry state-of-the-nation commentary. The result is an oblique, complex film which wants to make us ask why such murders happen in society, but without providing any simplistic answers. The film which shot Miyazaki and his Studio Ghibli to international fame, My Neighbour Totoro centres on the adventures of two young sisters who move with their father to a house in the country, to be close to their mother who is ailing in a nearby sanatorium. Minimalistic in plot, the film’s charm comes from making us see things through the eyes of its child characters, for whom every detail can induce awed wonder. Miyazaki’s immense imagination and his love of nature have free rein in his beautiful and meticulous painted animation bringing to life a magical world, influenced by the ghosts and spirits of Japanese folklore, in which creatures big and small, real or invented, co-exist. Both heart-warming and strangely darker than first expected, it remains an icon of Japanese anime — go without seeing it at your own peril. No list of Japanese films would be complete without a horror, and just as the J-horror trend was becoming a global phenomenon came this subtle yet creepily disconcerting psycho-thriller blending a series of unexplained murders, mind control and identity change. If these sound like the typical far-fetched subject matter for a horror, it is Kiyoshi Kurosawa’s (no relation to Akira) masterful control of atmosphere that makes it so atypical. Minimal use of music, elliptical cuts and long takes immerse you into the unease, unpredictability and meditative gravity of the plot. Cure is a mix of J-horror weirdness only made all the more disturbing by being undercut with an art-house sensibility, both chilling and hypnotic, and leaving you to ponder on many questions after its brave metaphysical climax. To come full circle, Kore-eda has often been called the “modern Ozu”, and in Nobody Knows he has updated the family drama to issues of contemporary society by basing it on a real-life news-story. A group of four children, abandoned by their mother, are left to fend for themselves without money in a small Tokyo apartment. Afraid that neighbours would alert social services, who in turn would split them into separate homes, the children decide to keep their situation a secret, and the harrowing poignancy of this is that it could happen in any large city without anyone finding out. Kore-eda draws incredibly intelligent performances from all his young cast, and the 14-year-old who plays the eldest boy even won the Best Actor prize at Cannes. Never melodramatic or overly sentimentalised despite its desperately sad premise, it’s a powerful depiction of children prematurely forced to cope with the harshness of the adult world, and one of the finest dramas of its decade.